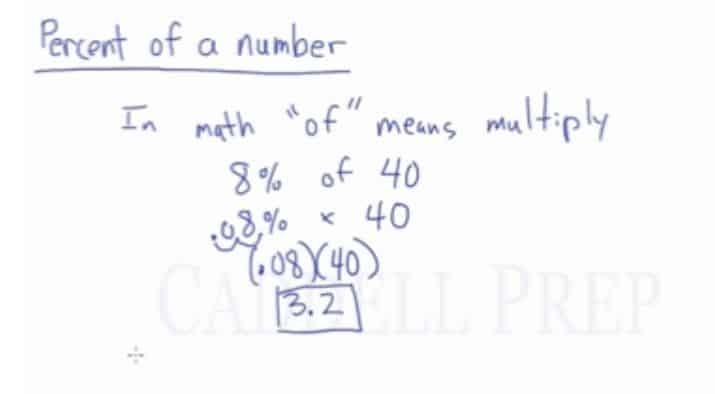 In this video, we will be learning how to find a percent of a number using proportions. What is 8% of 40? In math, ‘of’ means ‘multiply’. So if you’re asked of , it means . We can’t get the answer right away. We have to change into a decimal. So we have to move the decimal two spaces from the right to left. Another way to find the percent of a number is the percent formula. To isolate , let’s do the inverse operation. Which is the same answer using a different method. To sum up, you can multiply or use the percent formula to get the answer if the missing value is the “is” or the part. But if the missing value is the percent or the whole, you have to use the percent formula. What percent of is ? Here, we’re looking for the percent. We have the “of” and the “is”. Now, let’s do the inverse operation of multiplication which is division. So the answer to what percent of is ?